New York Mayor Michael Bloomberg at a recent event. 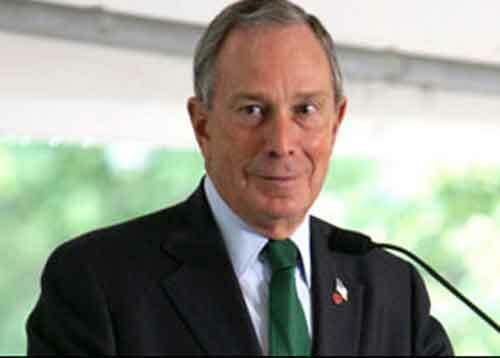 Bloomberg became that national face of urban test-based "school reform" after the Clinton administration noted that the claims of the administration of Chicago Mayor Richard M. Daley were unfounded. Despite the evidence, President Barack Obama appointed teacher-bashing Chicago schools chief Arne Duncan to head the U.S. Department of Education, and the Chicago plan (with a nod to New York) is now being expanded across the USA under the "Race to the Top" federal competition for scarce school resources. Über capitalist, Michael Bloomberg, became the poster billionaire boy for corporate education reform when he was elected mayor and named Dictator of Schools in the City. The Bloomberg-Klein model of test-punish-shut down-charterize became the urban model for the nation, and Klein has even been wined and dined in Australia and elsewhere as a distinguished expert in all matters educational. Bloomberg was able to use his great educational success and $100 million to squeak out re-election against an unknown opponent in 2009. Had the public known, as Bloomberg and Klein did, that the entire educational empire was built on the same kind of fraud that made Enron and AIG household names, he would not be mayor today. When New York State made its standardized English and math tests tougher to pass this year, causing proficiency rates to plummet, it said it was relying on a new analysis showing that the tests had become too easy and that score inflation was rampant. But evidence had been mounting for some time that the state’s tests, which have formed the basis of almost every school reform effort of the past decade, had serious flaws. The fast rise and even faster fall of New York’s passing rates resulted from the effect of policies, decisions and missed red flags that stretched back more than 10 years and were laid out in correspondence and in interviews with city and state education officials, administrators and testing experts. The process involved direct warnings from experts that went unheeded by the state, and a city administration that trumpeted gains in student performance despite its own reservations about how reliably the test gauged future student success. It involved the state’s decision to create short, predictable exams and to release them publicly soon after they were given, making coaching easy and depriving test creators of a key tool: the ability to insert in each test questions for future exams. Next year, for the first time, the tests will not be released publicly. It involved a national push for numbers-based accountability, begun under President George W. Bush and reinforced by President Obama. And it involved a mayor’s full embrace of testing as he sought to make his mark on the city, and then to get re-elected. “They just kept upping the stakes with the scores, putting more pressure on the schools but not really looking at what it all means,” said Pedro Noguera, an education professor at New York University who has worked with the city’s Department of Education to help improve struggling schools. New York has been a national model for how to carry out education reform, so its sudden decline in passing rates may be seen as a cautionary tale. The turnaround has also been a blow to Mayor Michael R. Bloomberg and his chancellor, Joel I. Klein, who despite warnings that a laserlike focus on raising scores could make them less and less reliable, lashed almost every aspect of its school system to them. Schools were graded on how much their scores rose and threatened with being closed if they did not. The scores dictated which students were promoted or left back, and which teachers and principals would receive bonuses. Even now, the city believes that the way it uses the tests is valid. The mayor and the chancellor have forcefully defended their students’ performance, noting that even after the changes this year, student scores are still better than they were in 2002. They have argued that their students’ progress is more important than the change in the passing rate, and that years of gains cannot be washed away because of a decision in Albany to require more correct answers from every student this year. The test scores were even used for a new purpose this year: to help determine which teachers should receive tenure. But given all the flaws of the test, said Prof. Howard T. Everson of the City University of New York’s Center for Advanced Study in Education, it is hard to tell what those rising scores really meant. , , , , A Decisive Year The city’s Department of Education constantly mines test score data for patterns to show where improvement is happening and where it is needed. In 2008, it noticed an incongruity: Eighth graders who scored at least a 3 on the state math exam had only a 50 percent chance of graduating from high school four years later with a Regents diploma, which requires a student to pass a certain number of tests in various subjects and is considered the minimum qualification for college readiness. The city realized that the test results were not as reliable as the state was leading people to believe. Mr. Klein and several of his deputies spoke by phone with Merryl H. Tisch, the vice chancellor of the Board of Regents, and Mr. Mills, trying to persuade them to create a statewide accountability system similar to the city’s, one that gave improvement at least as much weight as the score itself. The state said it would consider moving to such a system, but would need more time. Neither the city nor state publicly disclosed the concerns about the scores. By then, students across the state were preparing for the 2009 tests, filling in bubbles on mock answer sheets, using at least three years of previous state tests as guides. The scores arrived in May, and with them, the bluntest warning yet. Just before the results were released, a member of the Regents named Betty Rosa called Ms. Tisch, who had recently become chancellor. Ms. Rosa, who had been a teacher, principal and superintendent in the Bronx for nearly three decades, said the unprecedented high scores simply seemed too good to be true. She suggested the unthinkable: the scores were so unbelievable, she said, that the state should not publicly release them. “The question was really are we telling the public the truth,” Ms. Rosa said in a recent interview. Ms. Tisch, she said, relayed that she, too, found the scores suspicious, but that it would be impossible to withhold them. “It was like a train that was already in motion and no way to stop it,” Ms. Rosa said. “We have improved the test scores in English,” he continued, “and we expect the same results in math in a couple of weeks, every single year for seven years.” Four weeks later, it was announced that 82 percent of city students had passed the math tests. Because of the widespread improvement in the scores, 84 percent of all public schools received an A in the city’s grading system, something Mr. Klein said he later regretted. This year, the city limited the number of A’s to 25 percent of schools. The 2009 numbers came out as the mayor was trying to accomplish two goals: to persuade the Legislature to give the mayor control of the schools for another seven years; and to convince city voters that he deserved a third term. Mr. Bloomberg’s opponent, Comptroller William C. Thompson, had once been president of the Education Board. Indeed, according to exit polls, 57 percent of those who said education was their primary concern voted for Mr. Bloomberg, who won the election by a five-point margin. Mr. Wolfson, the deputy mayor and 2009 campaign strategist, said the mayor had no regrets about focusing on the exams as a matter of policy, and during the election. Ms. Tisch, in releasing the 2009 test results, had not heeded Ms. Rosa’s radical request. But the very day she put out the English test results, she began openly acknowledging doubts about the scores, irking the mayor and chancellor, who privately seethed that she was seeking to undermine their success. “As a board, we will ask whether the test is getting harder or easier,” she said.. . . .
Robert Gebeloff and Elissa Gootman contributed reporting, and Jack Begg contributed research.